I know, I know, back to Indonesian food. But this is a great recipe for your Independence Day backyard get together. Forget grilling only brats and burgers. Impress your friends with something a little different. 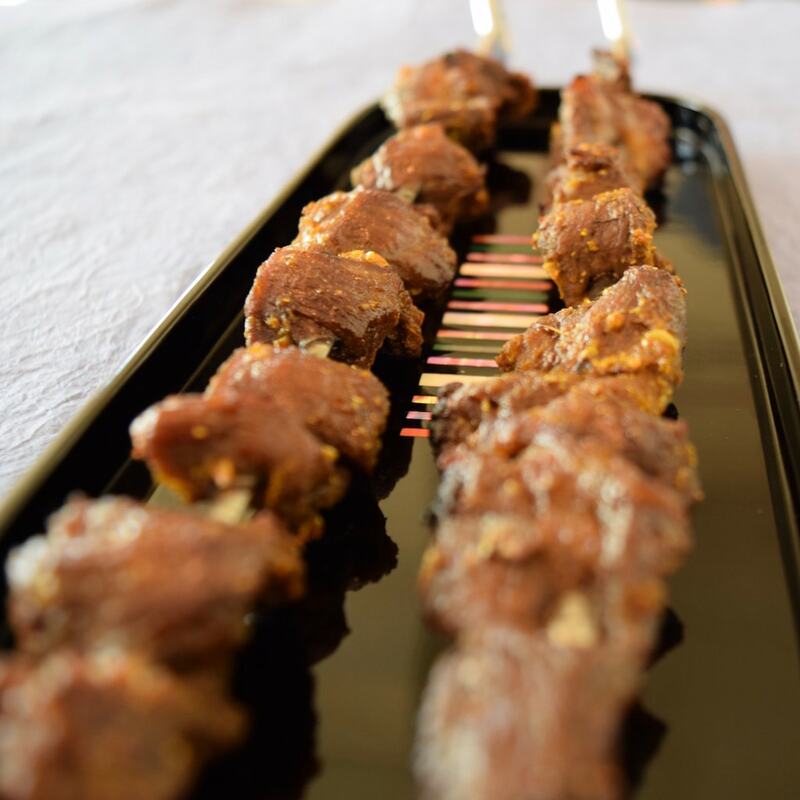 Between beef satay and the Thai grilled ribs that Philip featured, your family and friends will love this year’s grill-fest. And both recipes are really easy. Indonesia, like many countries, has a variety of delicious street foods, whose aromas waft through the streets attracting passersby who are hungry for a meal, or even a snack. And beef and chicken satay are street-food royalty. Mind you, this satay isn’t just skewered meat with a jar of crappy pre-made “satay sauce” dumped over it. This is the real thing. 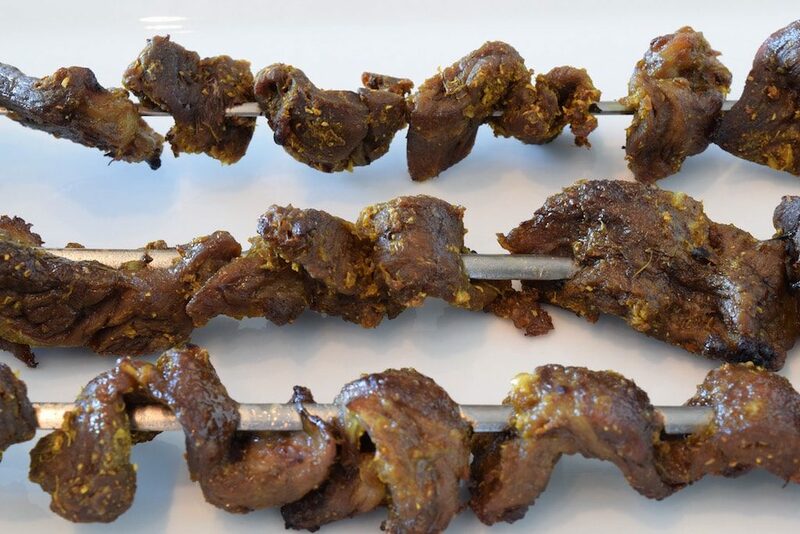 If you don’t have a grill, which condo life usually precludes, beef satay turns out equally delicious when broiled. And if you haven’t already guessed, this recipe is from my favorite cookbook: “Cradle of Flavor,” by James Oseland. If you’re using tamarind, 2t pulp in a non-metal bowl and check there are no pits, seeds or pod shards. Add the 3T water, mix and set aside. If you’re using coriander seeds, powder them in a food processor. Then add the shallots, garlic, turmeric, ginger, sugar, oil and salt, and pulse until it is a smooth paste. If the processor has a tough time pureeing it, add a tablespoon of water. Spoon into a non-metal bowl big enough to hold the cut-up meat. Slice the meat 0.25-inches thick against the grain with a very sharp knife. This can be done more easily if the meat is partially frozen. Add the sliced meat to the marinade bowl and thoroughly combine. Allow to marinade 1-2 hours. 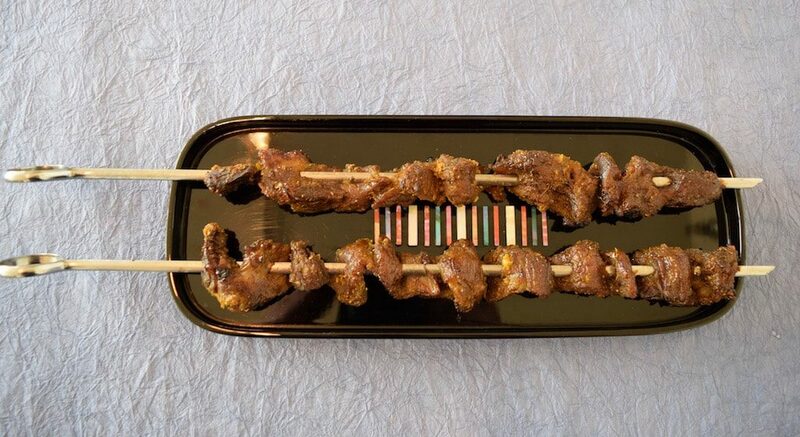 Marinating at room temperature is pretty standard, but if you feel that’s unsafe, especially for older folks, children or those with weakened immune systems, marinade under refrigeration. Now for the good part: after soaking your bamboo skewers (if using) skewer that meat, as I have done in the photos. Don’t pack it on too tight. Now it’s time to grill or broil. If grilling, oil the grates well so the meat doesn’t stick. Put on the grill for 2-5 minutes, depending on the temp, then turn over for the same amount of time. To test for doneness, touch the meat with your finger. If it is firm and not squishy, it’s done. Cooking on the broiler is just like broiling any other meat, about 3 or so inches from the heat source at it’s highest setting. For cooking time, same rules apply.